Here comes another weekly tutorial for iOS programming. 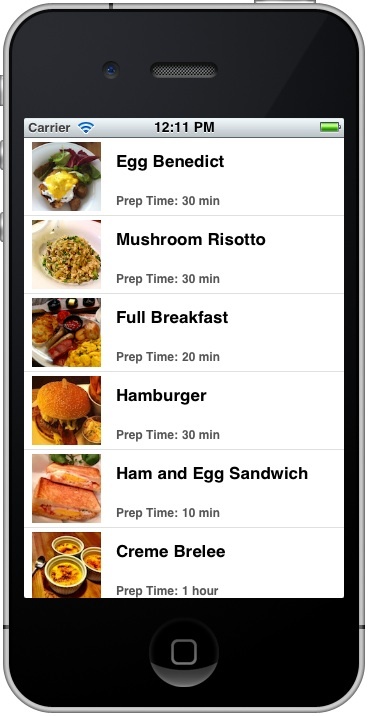 We already built a very simple table app displaying list of recipes. If you look into the app, all our recipes are specified in the source code. I try to keep the thing simple and focus on showing how to create a UITableView. However, it’s not a good practice to “hard code” every item in the code. In real app, we used to externalized these static items (i.e. the recipe information) and put them in a file or database or somewhere else. 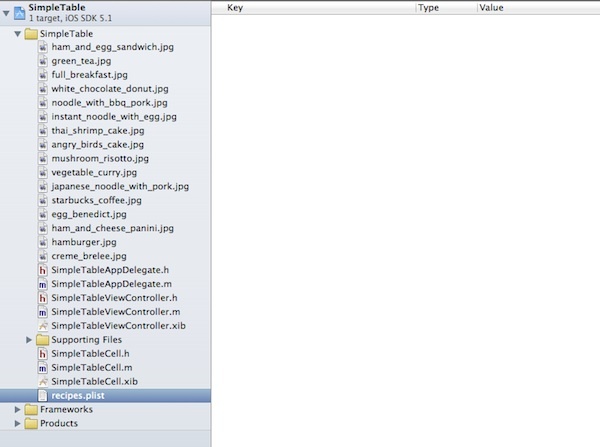 In iOS programming, there is a type of file called Property List. 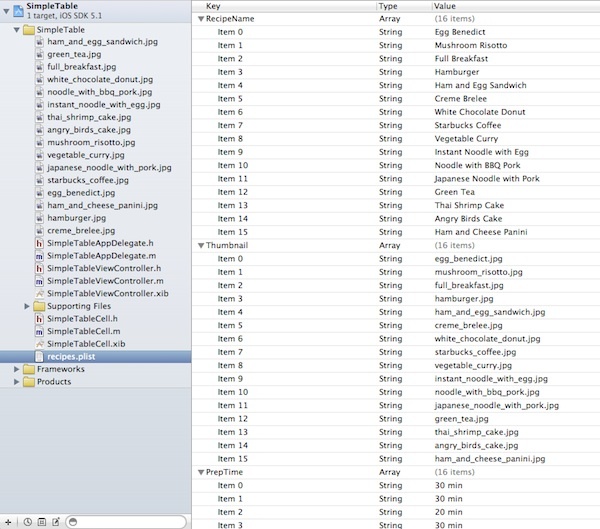 This kind of file is commonly found in Mac OS and iOS, and is used for storing simple structured data (e.g. application setting). In this tutorial, we’ll make some changes in our simple table app and tweak it to use Property List. Why Externalize the Table Data? There is nothing wrong doing this. But look at the code! It’s not easy to edit and you have to strictly follow the Objective C syntax. Changing the code may accidentally introduce other errors. That’s not we want. Apparently, it would be better to separate the data and the programming logic (i.e. the code). Does it look better when the table data is stored like this? In reality, you may not be the one who provides the table data (here, the recipe information). The information may be given by others without iOS programming experience. When we put the data in an external file, it’s easier to read/edit and more understandable. As you progress, you’ll learn how to put the data in server side (or what-so-called the Cloud). All data in your app are pulled from the server side on demand. It offers one big benefit. For now, any change of the data will require you to build the app and submit it for Apple’s approval. 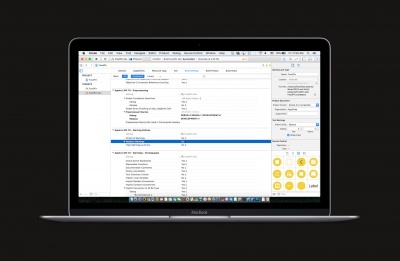 By separating the data and put them in the Cloud, you can change the data anytime without updating your app. We’re not going to talk about the Cloud for today. 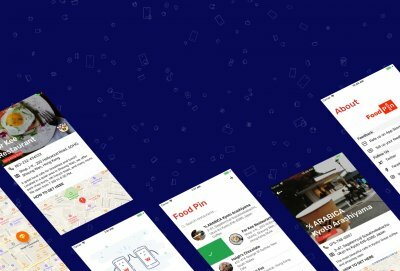 Let’s go back to the basic and see how you can put all the recipes in a Property List. Property list offers a convenient way to store simple structural data. It usually appears in XML format. If you’ve edited some configuration files in Mac or iPhone before, you may come across files with .plist extension. They are examples of the Property List. You can’t use property list to save all types of data. 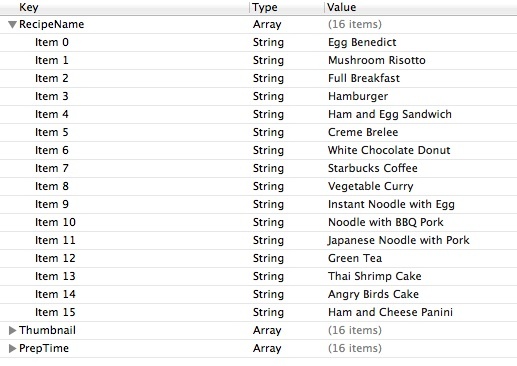 The items of data in a property list are of a limited number of types including “array”, “dictionary”, “string”, etc. For details of the supported types, you can refer to the Property List documentation. Property list is commonly used in iOS app for saving application settings. It doesn’t mean you can’t use it for other purposes. But it is designed for storing small amount of data. Is it the Best Way to Store Table Data? No, definitely not. We use property list to demonstrate how to store table data in an external file. It’s just an example. As you gain more experience, you’ll learn other ways to store the data. That’s enough for the background. Let’s get our hands dirty and convert the data into a property list. 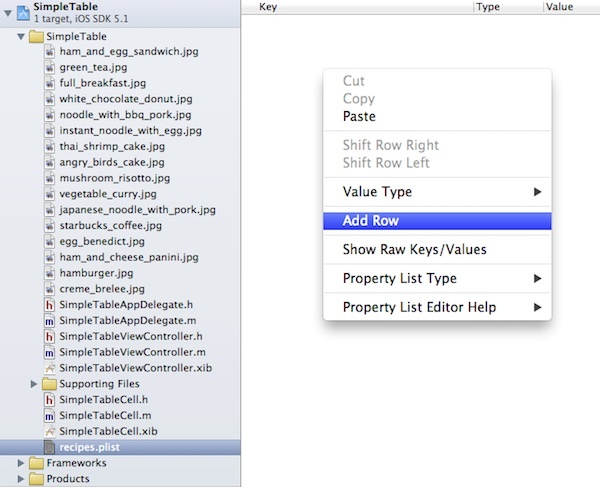 First, open the Simple Table project in Xcode. 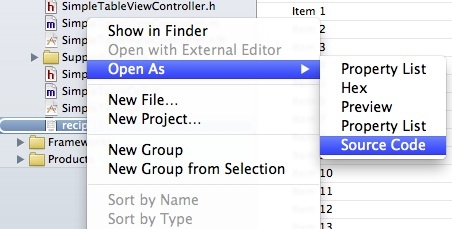 Right click on the “SimpleTable” folder and select “New File…”. Select “Other” under “iOS” template, choose “Property List” and click “Next” to continue. When prompted, use “recipes” as the file name. 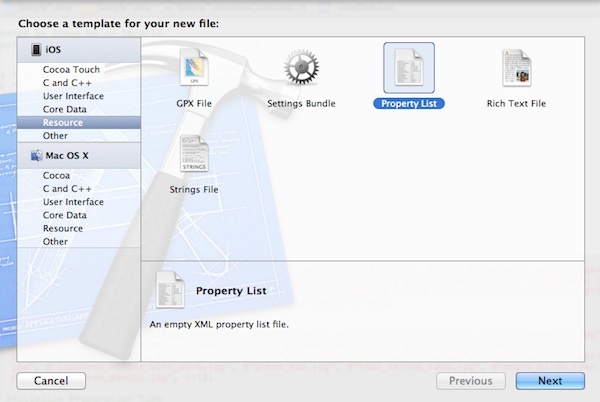 Once you confirm, Xcode will create the property list file for you. By default, the property list is empty. There are two ways to edit the property list. You can right-click on the editing area and select “Add Row” to add a new value. As we’re going to put the three data arrays in the property list, we’ll add three rows with “array” type. Name them with the keys: RecipeName, Thumbnail and PrepTime. The key serves as an identifier and later you’ll use it in your code to pick the corresponding array. 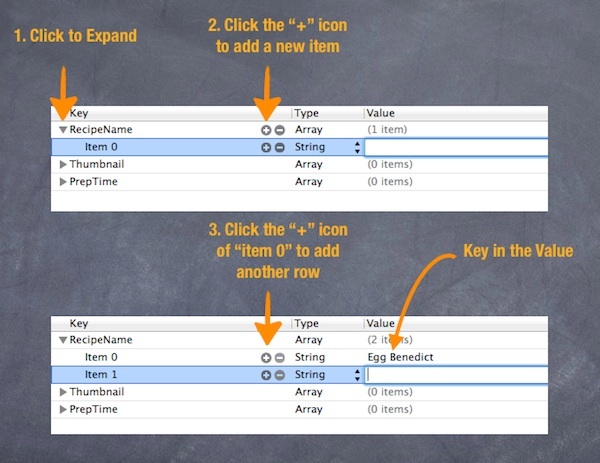 To add data in the array, just expand it and click the “+” icon to add a new item. Follow the steps in the below illustration if you don’t know how to do it. For your convenience, you may download the recipes.plist and add it to your project. As mentioned earlier, the property list is usually saved in the format of XML. To view the source of the property list, right click and select “Open as Source Code”. Next, we’ll change our code and load the recipe from the property list we just built. It’s fairly easy to read the content of property list. The iOS SDK already comes with some built-in functions to handle the read/write of the file. 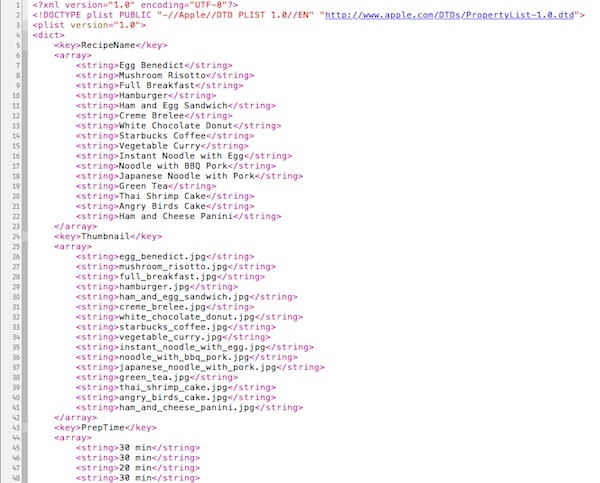 Line #2 – Before reading the “recipes.plist” file, you have to first retrieve the full path of the resource. Line #5 – You have defined three keys (RecipeName, Thumbnail, PrepTime) in the property list. In the example, each key is associated with a specific array, which is the value. In iOS programming, we use the term dictionary to refer to this key-value pair association. NSDictionary class provides the necessary methods for managing the dictionary. Here, we use the “initWithContentsOfFile” method of NSDictionary class to read the key-value pairs in a property list file. Line #6-8 – These lines of code retrieves the corresponding array with the key we defined earlier. Once you complete the change, try to run the app again. The app is the same as before. Internally, however, the recipes are loaded from the property list. Again, I hope you learnt a ton through this tutorial. By now you should have a better idea about property list and how you can make use of it to store small amount of data. Next up, we’ll take a look at Storyboard and Navigation Controller. As always, if you have any problem, leave comment below (or head to our forum) to share with us. Update: You can now download the full source code of the Xcode project. Another great insite to tables. How difficult is it to pull data from an XML file stored on another server. As u said earlier you would still need to submit this to the app store if u had a change. Thanks a bunch. I caught up with all your lessons. I feel like I am making progress leaps and bounds. FYI a typo in this lesson. Select “Other” under “iOS” template, choose “Property List” and click “Next” to continue. Select “Resource” under “iOS” template, choose “Property List” and click “Next” to continue. can the value inside the property list change due to the action perform by end user?? can the value inside the property list change due to the action performed by end user? Yes, but you need to save it back to the property list file. Thanks for the awesome post, is there a way I can have my table data in a spread sheet and then read it in like that. This would be really useful for the app I am making. Normally, you can store the table data in CSV (or XML) file format and load it in your app. Thanks, do you know where I could find a code sample of this? 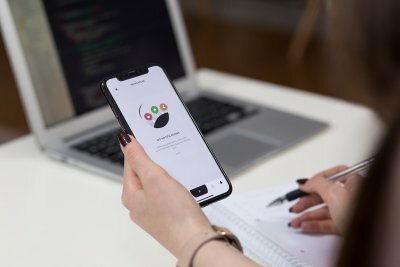 hi, first i would like to say your courses are great and they have helped me a lot in making an app for my restaurant. i have successfully loaded the RBViewController with a plist in my web service but i have been stuck for days trying to make the detail view load but without any luck. i would appreciate if you could help me with this. thank you. fantastic tutorial simon. what would we need to do to update the data from plist on a server? You’ll need to develop a simple server program that accepts request to update the data in plist file. Alternatively, you can check out http://www.parse.com that lets you easily save data in the backend. this is outstanding ! Thanks a lot for your effort writing this great tutorial. Cheers ! im just wondering how we would use this with the objects that we populated in the object oriented programming tutorial. like do we declare recipe with the Recipe class then do recipe.name = [dict objectForKey: name]; or something like that? I try to change several think, i found that data in tableData is loss. I move declaration for tableData and initialize to local (in function), it’s fine. This series of tutorials about Table views is one of the best on the whole Internet. You definitively made a great job right here Simon! When i replace the code to read from the property list, i get an empty basic list. As soon as i put the code back to defining the array manually, it works. I have downloaded the source files and replaced all of my h, m and xib files, but still no use. The source code works when i use it on its own. Looks like it’s been a year or so since this was written, but since i just stumbled upon this, it’s new to me. Anyway, thanks for the plist primer. I had actually set up my plist exactly like this for my app. 3 arrays: names, values, and category. Each item within corresponding by Item number. Can we add recipes at run time by the user,If user wants to add addition recipes in that? In this case how to store newly added recipes to plist programmatically? Any plans on updating this tutorial to swift 4? As per WWDC 2017 session 212 with code/decodable reading/writing to plist and JSONon iOS11 became a lot simpler.. I had the same issue. In my case, there was a checkpoint in my source code. After deleting it, the app worked perfectly. Hope this help! What did I did wrong? I follow this tutorial and the one in the book, but I won’t work, haha. 🙁 I made all my NSArray -> NSMutableArray. Love this tutorial and would love to see it updated for swift?? hello sir, i am trying to add row, but rather than adding row, its adding item within the root, i am not getting option to add recipename, thumbnail and preptime. Please help me to solve this prob as i am totally new in ios. Thanks for this tutorial.Tell me,can you make please this tutorial for swift? Hi Simon. Can we get a Swift version of this tutorial? Thanks. Very Nice tutorial.I learned much more. Thanks for doing it. Can you have some tutorial how can I load the data in the plist file using the custom class Recipe in the previous tutorial. I’ve encounter lot of errors trying to do that. Is that possible?